Mary Katherine Shaughnessy and King Lear are the Camping World Adult Amateur 51 & Over, Section A champions during the eleventh week of the 2011 FTI Winter Equestrian Festival. Photo © Sportfot, Official Sport Photographer of the FTI Winter Equestrian Festival, www.sportfot.com. 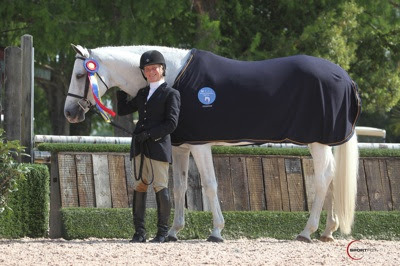 Wellington, FL - March 25, 2011 - The FTI Winter Equestrian Festival continued today with 12 rings of competition. The featured division in the E.R. 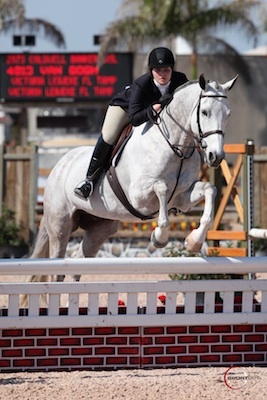 Mische Grand Hunter Ring was the Camping World Adult Amateur 51 & Over Hunters Section A. Mary Katherine Shaughnessy of Wellington, FL, and King Lear, owned by Shamrock Ventures, rode to the championship. Shaughnessy's Shamrock Ventures purchased King Lear, a fifteen-year-old Trakehner gelding by Induc, last year. "He is really, really perfect! He never does anything wrong. I'd say that he has changed my life," said Shaughnessy with a smile. It has been a very special week for Shaughnessy. Not only was she champion during the same week that is sponsored by FTI Consulting, Inc. (her husband Dennis is the Chairman), but she also became a first-time grandmother two days ago. "I would like to add that I became a grandmother two days ago. My first grandchild! Her name is Avery. It's been a big week!" beamed Shaughnessy. Shaughnessy only recently started doing the hunters after switching over from the jumper ring. Never receiving a ribbon lower than a third this week, Shaughnessy and King Lear were nearly unstoppable. The winning duo secured the tricolor honor by winning one class, placing second in three classes, and placing third in the division's remaining over fences class. This summer, Shaughnessy will take things a little slower. "We don't really show a lot in the summer. The main focus is here, but I'll probably go to Lake Placid and the Hampton Classic," explained Shaughnessy about her summer show schedule. Shaughnessy's good friend Margaret Taylor was awarded the reserve championship. Taylor was aboard her own entry, Quality Control, an eight-year-old Westphalen gelding. The pair won two of the division's five classes, including the under saddle, to secure their reserve championship. Tomorrow marks the start of the weekend, and junior and pony riders will be out in full swing. Stay tuned for results from the Large Junior Hunters 15 & Under, who are trying to solidify themselves in the circuit standings.